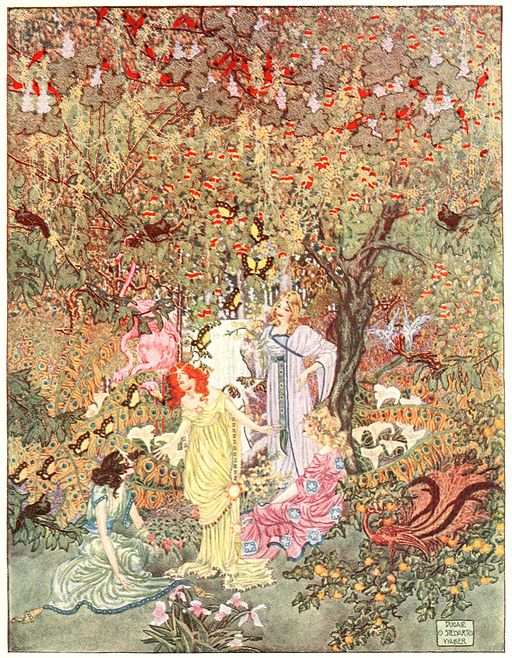 This fairy tale from Hans Christian Andersen was published in his fairy tales collection in 1914, featuring illustrations by Dugald Stewart Walker. There was once a king's son; nobody had so many or such beautiful books as he had. He could read about everything which had ever happened in this world, and see it all represented in the most beautiful pictures. He could get information about every nation and every country; but as to where the Garden of Paradise was to be found, not a word could he discover, and this was the very thing he thought most about. His grandmother had told him, when he was quite a little fellow and was about to begin his school life, that every flower in the Garden of Paradise was a delicious cake, and that the pistils were full of wine. In one flower history was written, in another geography or tables; you had only to eat the cake and you knew the lesson. The more you ate, the more history, geography and tables you knew. All this he believed then; but as he grew older and wiser and learnt more, he easily perceived that the delights of the Garden of Paradise must be far beyond all this. This is what he said then, and he still said it when he was seventeen; his thoughts were full of the Garden of Paradise. He walked into the wood one day; he was alone, for that was his greatest pleasure. Evening came on, the clouds drew up and it rained as if the whole heaven had become a sluice from which the water poured in sheets; it was as dark as it is otherwise in the deepest well. Now he slipped on the wet grass, and then he fell on the bare stones which jutted out of the rocky ground. Everything was dripping, and at last the poor Prince hadn't got a dry thread on him. He had to climb over huge rocks where the water oozed out of the thick moss. He was almost fainting; just then he heard a curious murmuring and saw in front of him a big lighted cave. A fire was burning in the middle, big enough to roast a stag, which was in fact being done; a splendid stag with its huge antlers was stuck on a spit, being slowly turned round between the hewn trunks of two fir trees. An oldish woman, tall and strong enough to be a man dressed up, sat by the fire throwing on logs from time to time. 'There is a shocking draught here,' said the Prince, as he sat down on the ground. 'Who are your sons?' asked the Prince. 'Well that's not so easy to answer when the question is stupidly put,' said the woman. 'My sons do as they like; they are playing rounders now with the clouds up there in the great hall,' and she pointed up into the sky. 'Oh, I daresay they have nothing else to do! I have to be harsh if I am to keep my boys under control! But I can do it, although they are a stiff-necked lot! Do you see those four sacks hanging on the wall? They are just as frightened of them as you used to be of the cane behind the looking-glass. I can double the boys up, I can tell you, and then they have to go into the bag; we don't stand upon ceremony, and there they have to stay; they can't get out to play their tricks till it suits me to let them. But here we have one of them.' It was the Northwind who came in with an icy blast; great hailstones peppered about the floor and snow-flakes drifted in. He was dressed in bearskin trousers and jacket, and he had a sealskin cap drawn over his ears. Long icicles were hanging from his beard, and one hailstone after another dropped down from the collar of his jacket. This had its effect, and the Northwind told them where he came from, and where he had been for the last month. 'Then you've been doing evil!' said the mother of the winds. 'Is that the little Zephyr?' asked the Prince. He looked like a wild man of the woods, but he had a padded hat on so as not to come to any harm. He carried a mahogany club cut in the American mahogany forests. It could not be anything less than that. 'Where do you come from?' asked his mother. 'And you have done nothing else?' asked the old woman. 'I have been turning somersaults in the Savannahs, patting the wild horse, and shaking down cocoanuts! Oh yes, I have plenty of stories to tell! But one need not tell everything. You know that very well, old woman!' and then he kissed his mother so heartily that she nearly fell backwards; he was indeed a wild boy. The Southwind appeared now in a turban and a flowing bedouin's cloak. 'It is hot enough here to roast a polar bear,' said the Northwind. 'You are a polar bear yourself!' said the Southwind. 'Then you have only been doing harm!' said the mother. 'Into the bag you go!' And before he knew where he was she had the Southwind by the waist and in the bag; it rolled about on the ground, but she sat down upon it and then it had to be quiet. 'Your sons are lively fellows!' said the Prince. It was the Eastwind, and he was dressed like a Chinaman. She did open it and the Southwind crept out, but he was quite crestfallen because the strange Prince had seen his disgrace. 'Let us have something to eat now!' said the mother of the winds; and they all sat down to eat the roast stag, and the Prince sat by the side of the Eastwind, so they soon became good friends. 'Of course,' said the Prince. When the Prince woke up in the early morning, he was not a little surprised to find that he was already high above the clouds. He was sitting on the back of the Eastwind, who was holding him carefully; they were so high up that woods and fields, rivers and lakes, looked like a large coloured map. 'It was very rude of me to leave without saying good-bye to your mother and brothers,' said the Prince. 'One is excused when one is asleep!' said the Eastwind, and they flew on faster than ever. You could mark their flight by the rustling of the trees as they passed over the woods; and whenever they crossed a lake, or the sea, the waves rose and the great ships dipped low down in the water, like floating swans. Towards evening the large towns were amusing as it grew dark, with all their lights twinkling now here, now there, just as when one burns a piece of paper and sees all the little sparks like children coming home from school. The Prince clapped his hands, but the Eastwind told him he had better leave off and hold tight, or he might fall and find himself hanging on to a church steeple. The eagle in the great forest flew swiftly, but the Eastwind flew more swiftly still. The Kossack on his little horse sped fast over the plains, but the Prince sped faster still. 'Are we in the Garden of Paradise now?' asked the Prince. 'So that is the way to the Garden of Paradise!' said the Prince. Now they entered the cavern. Oh, how icily cold it was; but it did not last long. The Eastwind spread his wings, and they shone like the brightest flame; but what a cave it was! Large blocks of stone, from which the water dripped, hung over them in the most extraordinary shapes; at one moment it was so low and narrow that they had to crawl on hands and knees, the next it was as wide and lofty as if they were in the open air. It looked like a chapel of the dead, with mute organ pipes and petrified banners. 'We seem to be journeying along Death's road to the Garden of Paradise!' said the Prince, but the Eastwind never answered a word, he only pointed before them where a beautiful blue light was shining. The blocks of stone above them grew dimmer and dimmer, and at last they became as transparent as a white cloud in the moonshine. The air was also deliciously soft, as fresh as on the mountain-tops and as scented as down among the roses in the valley. A river ran there as clear as the air itself, and the fish in it were like gold and silver. Purple eels, which gave out blue sparks with every curve, gambolled about in the water; and the broad leaves of the water-lilies were tinged with the hues of the rainbow, while the flower itself was like a fiery orange flame, nourished by the water, just as oil keeps a lamp constantly burning. A firm bridge of marble, as delicately and skilfully carved as if it were lace and glass beads, led over the water to the Island of Bliss, where the Garden of Paradise bloomed. The Eastwind took the Prince in his arms and bore him over. The flowers and leaves there sang all the beautiful old songs of his childhood, but sang them more wonderfully than any human voice could sing them. Were these palm trees or giant water plants growing here? The Prince had never seen such rich and mighty trees. The most wonderful climbing plants hung in wreaths, such as are only to be found pictured in gold and colours on the margins of old books of the Saints or entwined among their initial letters. It was the most extraordinary combination of birds, flowers and scrolls. Close by on the grass stood a flock of peacocks with their brilliant tails outspread. Yes, indeed, it seemed so, but when the Prince touched them he saw that they were not birds but plants. They were big dock leaves, which shone like peacocks' tails. Lions and tigers sprang like agile cats among the green hedges, which were scented with the blossom of the olive, and the lion and the tiger were tame. The wild dove, glistening like a pearl, beat the lion's mane with his wings; and the antelope, otherwise so shy, stood by nodding, just as if he wanted to join the game. The Fairy of the Garden now advanced to meet them; her garments shone like the sun, and her face beamed like that of a happy mother rejoicing over her child. She was young and very beautiful, and was surrounded by a band of lovely girls, each with a gleaming star in her hair. When the Eastwind gave her the inscribed leaf from the Phoenix her eyes sparkled with delight. She took the Prince's hand and led him into her palace, where the walls were the colour of the brightest tulips in the sunlight. The ceiling was one great shining flower, and the longer one gazed into it the deeper the calyx seemed to be. The Prince went to the window, and looking through one of the panes saw the Tree of Knowledge, with the Serpent, and Adam and Eve standing by. 'Are they not driven out?' he asked, and the Fairy smiled, and explained that Time had burned a picture into each pane, but not of the kind one usually sees; they were alive, the leaves on the trees moved, and people came and went like the reflections in a mirror. Then he looked through another pane, and he saw Jacob's dream, with the ladder going straight up into heaven, and angels with great wings were fluttering up and down. All that had ever happened in this world lived and moved on these window panes; only Time could imprint such wonderful pictures. The Fairy smiled and led him into a large, lofty room, the walls of which were like transparent paintings of faces, one more beautiful than the other. These were millions of the Blessed who smiled and sang, and all their songs melted into one perfect melody. The highest ones were so tiny that they seemed smaller than the very smallest rosebud, no bigger than a pinpoint in a drawing. In the middle of the room stood a large tree, with handsome drooping branches; golden apples, large and small, hung like oranges among its green leaves. It was the Tree of Knowledge, of whose fruit Adam and Eve had eaten. From every leaf hung a shining red drop of dew; it was as if the tree wept tears of blood. It was a curious sight to see the whole coast move. Here came lofty snow-clad Alps, with their clouds and dark fir trees. The horn echoed sadly among them, and the shepherd yodelled sweetly in the valleys. Then banian trees bent their long drooping branches over the boat, black swans floated on the water, and the strangest animals and flowers appeared on the shore. This was New Holland, the fifth portion of the world, which glided past them with a view of its blue mountains. They heard the song of priests, and saw the dances of the savages to the sound of drums and pipes of bone. The pyramids of Egypt reaching to the clouds, with fallen columns, and Sphynxes half buried in sand, next sailed past them. Then came the Aurora Borealis blazing over the peaks of the north; they were fireworks which could not be imitated. The Prince was so happy, and he saw a hundred times more than we have described. 'Can I stay here always?' he asked. 'I will remain here!' said the Prince. And the Eastwind kissed him on the mouth and said: 'Be strong, then we shall meet again in a hundred years. Farewell! Farewell!' And the Eastwind spread his great wings; they shone like poppies at the harvest time, or the Northern Lights in a cold winter. 'Good-bye! good-bye!' whispered the flowers. Storks and pelicans flew in a line like waving ribbons, conducting him to the boundaries of the Garden. And the Fairy led him into a large hall of white transparent lilies, the yellow stamens in each formed a little golden harp which echoed the sound of strings and flutes. Lovely girls, slender and lissom, dressed in floating gauze, which revealed their exquisite limbs, glided in the dance, and sang of the joy of living--that they would never die--and that the Garden of Paradise would bloom for ever. Then the Fairy beckoned to him and said so tenderly, 'Come with me,' that he rushed towards her, forgetting his promise, forgetting everything on the very first evening that she smiled and beckoned to him. The fragrance in the scented air around grew stronger, the harps sounded sweeter than ever, and it seemed as if the millions of smiling heads in the hall where the Tree grew nodded and sang, 'One must know everything. Man is lord of the earth.' They were no longer tears of blood which fell from the Tree; it seemed to him that they were red shining stars. 'Come with me, come with me,' spoke those trembling tones, and at every step the Prince's cheeks burnt hotter and hotter and his blood coursed more rapidly. The Fairy dropped her shimmering garment, drew back the branches, and a moment after was hidden within their depths. 'I have not sinned yet!' said the Prince, 'nor will I'; then he drew back the branches. There she lay asleep already, beautiful as only the Fairy in the Garden of Paradise can be. She smiled in her dreams; he bent over her and saw the tears welling up under her eyelashes. 'Do you weep for me?' he whispered. 'Weep not, beautiful maiden. I only now understand the full bliss of Paradise; it surges through my blood and through my thoughts. I feel the strength of the angels and of everlasting life in my mortal limbs! If it were to be everlasting night to me, a moment like this were worth it!' and he kissed away the tears from her eyes; his mouth touched hers. Then came a sound like thunder, louder and more awful than any he had ever heard before, and everything around collapsed. The beautiful Fairy, the flowery Paradise sank deeper and deeper. The Prince saw it sink into the darkness of night; it shone far off like a little tiny twinkling star. The chill of death crept over his limbs; he closed his eyes and lay long as if dead. The cold rain fell on his face, and the sharp wind blew around his head, and at last his memory came back. 'What have I done?' he sighed. 'I have sinned like Adam, sinned so heavily that Paradise has sunk low beneath the earth!' And he opened his eyes; he could still see the star, the far-away star, which twinkled like Paradise; it was the morning star in the sky. He got up and found himself in the wood near the cave of the winds, and the mother of the winds sat by his side. She looked angry and raised her hand. Add The Garden of Paradise to your own personal library.